One of the many reasons there are so many older BMWs on the road is because of the factory scheduled maintenance regime. The engineers at BMW who designed the vehicles devised a schedule of parts and fluid replacement based on an estimation of the real-world life expectancy of these components and fluids. In the 1980’s BMW began a rigorous, yet easy to follow and understand, mileage-based system with the Service One and Service Two, also called the Inspection One and Inspection Two. 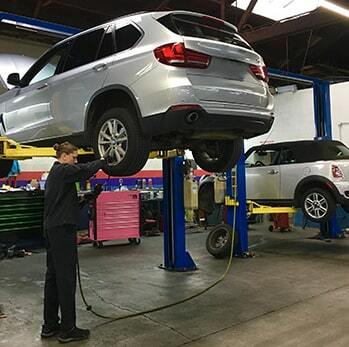 While there were minor differences between vehicles depending on engine families and models, the Service One was generally a minor service with an oil change, while the Service Two involved a major tune-up. Additionally, inspections of the vehicle, in pretty fair detail in the case of the Service two, are included. Following this maintenance schedule extended the longevity of an already well-built car, found issues before they became problems, and saved owners money because maintenance is less expensive than breakdown repair. With the explosion of sensor technology in the early 2000’s, BMW began the adoption of what they term Condition Based Services (CBS). The vehicle monitors the condition of consumable components and fluids, like brakes and oil, and inform through the display how much life is left with a mileage estimate. Regardless the technology or name, the recommendations are made to prevent breakdown and allow for maintenance on a schedule, and one that is convenient for the owner.